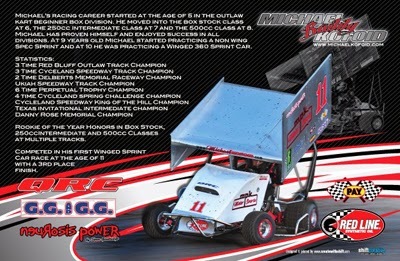 One of sprint car racing’s newest champions is also one of the sport’s youngest drivers. 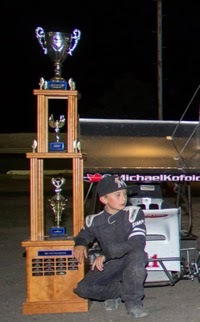 Eleven-year-old Michael “Buddy” Kofoid Jr. wrapped up the King of the West Lites title during a doubleheader weekend at Reno Tahoe Fernley Speedway. Kofoid racked up four victories and eighth podium finishes driving the No. 3 sprint car for track promoter Dan Simpson, who saw promise in the youngster and gave him the opportunity to compete in the division. Kofoid, of Penngrove, California, began racing go-karts when he was five years old and this was his first season driving sprint cars. While it is fantastic and exciting that an 11-year-old can demonstrate the driving talent and determination to win his first Championship, NASCAR Race Mom cannot help but ponder the negative aspect of someone this young in such a high-powered racecar. “Buddy” is well aware of racing’s pit-falls. Earlier this year, a teenage race car driver from Petaluma careened off the track and into pit row Saturday night killing two, including his 14-year-old cousin, Marcus. The deadly crash happened at Marysville Raceway Park, which is north of Sacramento. Young Kofoid was friends with the individual involved in the racing tragedy. “He was probably the best person to be around, most of the time," Michael Jr. said at the time. "He's just always nice and nice to talk to." The 11-year-old says he's sad at Marcus' passing, but he will continue to race. As the mother of a race car driver, I believe I can relate to Michael’s mother’s predicament. You experience extreme pride in your child’s triumphs while conquering any negative feelings of misfortune. Congratulations to Michael and his family for accomplishing the family teamwork this championship represents.